Whispers in the Loggia: En Route to Portugal, a "Fatima Message"
To commemorate the 93rd anniversary of the first apparition at Fatima, B16 departed Rome this morning for a four-day visit to Portugal, the 15th trek outside Italy of his five-year reign. 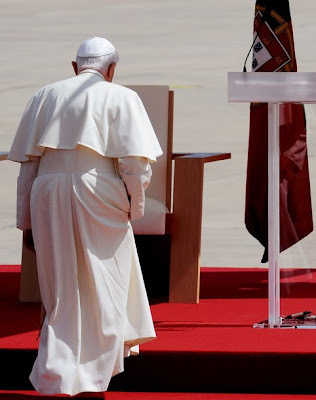 "[B]eyond this great vision of the suffering Pope, which we can initially circumscribe to John Paul II, other realities are indicated which over time will develop and become clear. Thus it is true that beyond the moment indicated in the vision, one speaks about and sees the necessity of suffering by the Church, which is focused on the person of the Pope, but the Pope stands for the church, and therefore sufferings of the Church are announced. The Lord told us that the Church will always be suffering in various ways, up to the end of the world. The important point is that the message, the answer of Fatima, it not substantially addressed to particular devotions, but is the fundamental response: permanent conversion, penance, prayer, and the three cardinal virtues: faith, hope and charity. Here we see the true, fundamental response the Church must give, which each of us individually must give, in this situation. "In terms of what we today can discover in this message, attacks against the Pope or the Church do not only come from outside; rather the sufferings of the Church come from within, from the sins that exist in the Church. This too has always been known, but today we see it in a really terrifying way: the greatest persecution of the Church does not come from enemies on the outside, but is born from the sin within the church, the Church therefore has a deep need to re-learn penance, to accept purification, to learn on one hand forgiveness but also the need for justice. Forgiveness is not a substitute for justice. In one word we have to re-learn these essentials: conversion, prayer, penance, and the theological virtues. That is how we respond, and we need to be realistic in expecting that evil will always attack, from within and from outside, but the forces of good are also always present, and finally the Lord is stronger than evil and the Virgin Mary is for us the visible maternal guarantee that the will of God is always the last word in history."